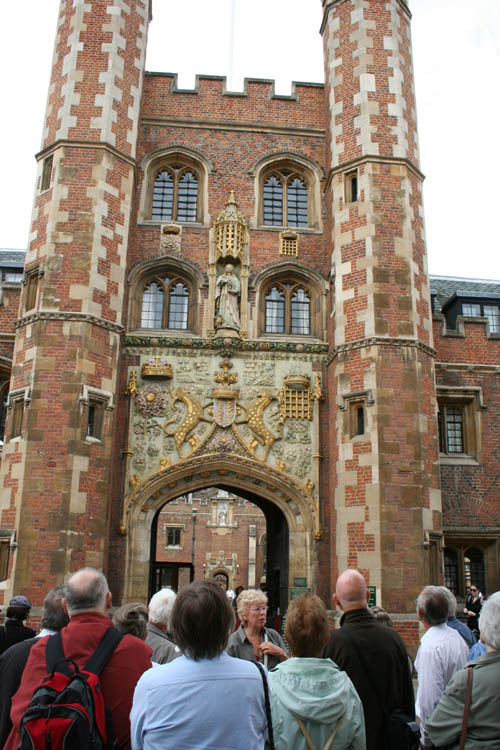 Among the society's trips in 2010 was a visit to Cambridge on 9th of June. The day started at the American War Cemetery at Madingley, the land for which was given by the Colleges of Cambridge as a token of their gratitude for the sacrifice the Americans made during World War II. The chapel and grounds are very well kept, and the sight of so many grave markers mostly of very young men is a tragic reminder of the cost of war. Passing Madingley Post Mill we proceeded to Cambridge where we left the coach on the banks of the River Cam to begin our guided walking tour of the city. We entered the city centre at Magdalene Street and then on to Bridge Street where we saw the Round Church. We turned into St. Johns Street passing the college from which it takes its name. We walked onwards down Trinity Lane passed the fake windows, Trinity College, Gonville and Caius College with its magnificent sundial, and looked through the gates to Clare College. We eventually arrived at Kings College where we were shown Kings College Chapel, a most spectacular building. Reaching Silver Street a group of us boarded punts at the Mill Pond to be punted along the Cam and view The Backs, where, because it was the end of exams, students were pushing each other off the banks and into the river to celebrate. Our punter like a Venetian gondolier gave us a guided tour of The Backs and the colleges visible from there and returned us to the Mill Pond. After a late lunch we made our way back to the coach for the homeward journey.